There is little more rewarding than exploring the countryside and finding food growing wild that you can take home and use in your cooking. 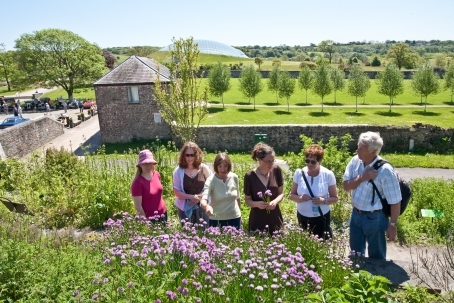 The natural world has so much to offer in the way of culinary delights and the National Botanic Garden of Wales’ fun weekend will allow you to explore your wild side. Taking place across the weekend of May 30-31, visitors can discover where free medicine grows, what’s healthy in the hedgerow; join a foray in a meadow and wild-pick ingredients to make a pesto and a pizza topping. This really is wild food at your fingertips and we have gathered together here in the Garden some of the finest foragers to guide you on your way and help you learn to forage responsibly. Explore, enjoy, taste and discover the fabulous free food – much of which can be found in your own backyard. Adele Nozedar 2pm-3.15pm The Garden Forager – a talk (and a book-signing) plus a common or garden lilac cocktail for all! on the stage area in the Great Glasshouse. This entry was posted in Activities, Festival, Food, forage, Things to do and tagged activities, adele nozedar, food, forage, things to do. Bookmark the permalink.